Advantages: Excellent coverage of finish and markings for the period; lots of revelations about background to marking decisions; much inspiration for modellers; detailed description by aircraft type. Disadvantages: Uneven quality of some photos; somewhat crowded format; too much history of aircraft types for a "colours and markings" book. Pat Martin is an evil man. He takes a subject near and dear to RCAF enthusiasts and shreds what were held as common and simple beliefs. I thought I knew a fair bit about post-war RCAF markings and this book shows the reality of how I’d only scratched the surface of this complex subject. 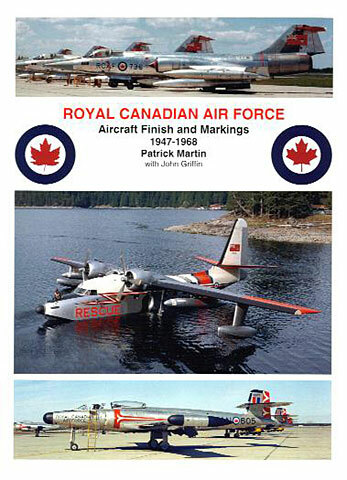 The book covers all standard markings used by the post-war RCAF, starting from the first trials in 1947 and concluding on that black February day in 1968 when the RCAF ceased to exist, becoming a component of today’s Canadian Armed Forces (CAF). This work is a follow-on companion volume to Pat Martin’s first Canadian markings book, which covered the CAF period from 1968 to 1997 (now in revision to bring it up to today). At just about 290 pages it is chock-full of hard data and insightful information. It is spiral-bound, allowing easy viewing while researching your latest project. Laser-printing on good-quality smooth paper greatly contributes to crisper photo and drawing reproduction. It is definitely produced to a much higher standard than the original ‘CAF 68‑97’ markings book. There is very little fluff in here to interrupt your reading pleasure of the six main chapters: Introduction, Finish, Markings, Special Purpose Schemes, RCAF in Colour, Aircraft Types, and Appendices. There are three main types of information presented: copies of official RCAF drawings, a wide variety of photographs, and a wealth of supporting text. Unit markings are deliberately not covered in any detail. Given the broad scope of the main subject, this was a wise decision, as this material could fill another volume all on its own. ‘Markings’ describes and details the four general markings’ periods for the post-war RCAF. Here we find that logistical, economic, and practical realities behind various markings’ schemes drove many of the changes towards a simpler system. This chapter’s subsection on ‘Roundels’ walks you through from wartime RAF markings through the various evolutions towards the definitive RCAF roundel. What came as a major embarrassment to me was seeing some of the abominable representations of the RCAF maple leaf that appeared on our aircraft, making the worst artwork of Esci’s and Italeri’s decal designers a lot closer to reality than some RCAF refinishers were. This chapter also delves into some of the issues behind some of the changes to the RCAF’s markings. There are interesting glimpses into the realities that modellers don’t have to consider, for example, why new markings didn’t change overnight – simple answer, the expense was too much to be absorbed by the budget. Consequently we ended up with a huge variety of mixed markings’ styles on a given fleet at a given time. Revelations are rampant, as you are walked through the mire of official marking changes, and the squadron-level interpretations of the sometimes-vague directions given by RCAF Headquarters: the perplexing change from Red to Day-Glo anti-collision markings, and then back to Red again is well-explained. I’d always thought the current CAF roundel change was driven by CF Unification, and Pat Martin makes it clear that this was not the case. In 1965, Canadian flag decals were made available to units, allowing a quick transition to the new marking, but the roundels were slower to change over to the ‘new leaf’. ‘RCAF in Colour’ is eight pages, comprising 48 photos that have been well-selected to illustrate markings over the 1947‑68 period. Some are inspirational for future projects; if the metal/grey/Red/Day-Glo Lancaster 10DC with Firebee drones doesn’t get you tearing the shrink wrap off a kit, then nothing will. Or, to quote an old IPMS Ottawa friend, “No blood flows below your neck.”. Included here are useful colour illustrations of all roundels and fin markings to show how our markings evolved, and representations of the main paint colours used on RCAF aircraft. However, I found these laser-printed colour samples to be not very helpful, primarily due to the limitations of the printing process. The problem is that the Canadian colour standards are all long out of production, and not many readers will have access to any of the 1-GP-12 series of documents. Consequently, a 1-GP-12 colour cross-reference with something like FS595 would have been more useful to the modeller. ‘Aircraft Types’ fills the last two-thirds of the book, going from the Albatross to the Yukon. Minor types such as the Anson are covered in about a page, while more diverse types get more space. Other examples are the Dakota (9), T-Bird (10), and the lion’s share goes to the Sabre at 16 pages. It is safe to say that each type is well and fully covered in the same level of detail, allowing the modeller to do a fair extrapolation of a given aircraft’s full finish from partial photographic evidence. · For the subject of aircraft markings and finishes, for me there is too much space devoted to aircraft type histories. While interesting, the historical data does nothing to help the reader understand the main subject matter. Perhaps this aspect of the book is a concession to the less-informed reader, and not necessarily aimed at the more knowledgeable researcher. Nevertheless, leaving out this material could have resulted in a smaller book, or allowed more/larger photos and drawings to be used. · Photo size and reproduction quality, while still being a vast improvement over the author’s previous work, is a bit uneven, and even disappointing in a few areas. It has improved dramatically over the ’CAF 68‑97’ book, and most photos now show much greater detail, satisfying that need to always know more about your next project. The photos do illustrate the markings well, but some of them leave you wanting for bigger and better images. This is perhaps a result of very few good images being available for some of the more obscure markings illustrated. · Some of the text breaks on the pages leave the reader searching for where to pick up and continue. This is partly because the use of white space is not generous, and even crowded in some spots. But on the other hand, you can be happy that you’re paying for ink and not blank paper! · Some information is frustrating to read, in that you can only get a portion of the whole story. For example, finding out that our Red & Blue H-34 helicopters were used by civilian contractors in the same RCAF scheme, but not in RCAF markings. A photo of this would have been great, but it was outside the scope of the work, and it therefore remains a tantalizing mental image. In summary, the amount of detail and information presented in this work is mind-boggling, and worth the value to RCAF enthusiasts. The best you can hope for is to read the book thoroughly, know what and how the topics are covered, and then keep it handy on the reference shelf. For the student of post-war RCAF markings, this is a book that you will find yourself picking up and consulting over and over again – there is that much solid information and background data to be found. I highly recommend this book to modellers and researchers with an interest in Canadian military aviation.